Afghanistan aim to continue the supremacy in ODI's. Afghanistan whitewashed Ireland in the T20I series. They will now aim to assert their momentum in the ODI series, when they host Ireland in the first fifty over fixture on Thursday, February 28 at the Rajiv Gandhi International Cricket Stadium in Dehradun. Both teams have played 20 ODI games against each other and share the head to head honours at 10-10. While in case of matches being hosted in India, the scoreline slightly favours the Afghans at 3-2. 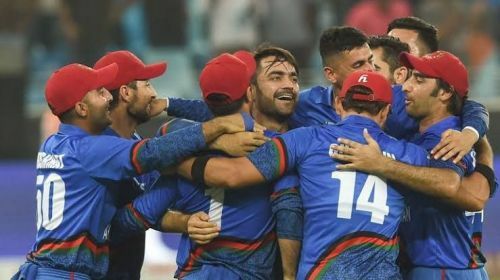 Afghanistan are coming off an impressive show in the T20I series and also won their most recent ODI series against same opponents by 2-1, which makes them overwhelming favourites ahead of the series. Afghanistan batters were phenomenal during the T20I face-off and the return of Mohammad Shahzad will only make it daring. Shahzad (2508), Mohammad Nabi (2435), skipper Asghar Afghan (1787) and Rahmat Shah (1713) are teams leading run-getters in the ODI format. Hazratullah's fiery knock of 162 in T20 has certainly raised the fans expectations from him. When it comes to bowling, the team boasts a strong spin unit in Rashid Khan, Mujeeb ur Rahman and experienced Nabi. Nabi was team's player of the series in T20 International, while Rashid is their leading wicket-taker with 193 wickets. The spin trio are likely to trouble the opponents the most. Asghar Afghan (C), Gulbadin Naib, Mohammad Nabi, Najibullah Zadran, Rashid Khan, Mujeeb Ur Rahman, Aftab Alam, Hazratullah Zazai, Mohammad Shahzad (W), Rahmat Shah and Hashmatullah Shahidi. Ireland eye revenge in the ODI series. On the flipside, Ireland are all wounded with the beating they received in the T20Is and hope for the change in fortunes with the change of the format. The Irish batting relies mostly on skipper William Porterfield, Paul Stirling and Kevin O'Brien. All three are the teams most experienced campaigners in the ODIs and currently leads the batting charts with 3722, 3346 and 3172 runs respectively and it will be mainly up to them to get the scoreboard ticking. Boyd Rankin and George Dockrell are team's most successful bowlers in the fifty over format and the skipper needs these two to make a few breakthroughs early on. Tim Murtagh and Simi Singh, mostly known for their economical spells, will also look to be amongst the wickets. Both have proved their worth for the team in past and will be expected to restrict the Afghans with their tight spells in the middle overs. William Porterfield (C), Paul Stirling, Andrew Balbirnie, Stuart Poynter (W), Lorcan Tucker, Simi Singh, Kevin O'Brien, George Dockrell, Tim Murtagh, Barry McCarthy and Boyd Rankin.